Wish I could carry it over to next season. I will be fine if i started with a 1000/10/100+5.1% blind pledge next season..
Gratz! I got the same... with the same rolls... THREE TIMES! Gave two of them away to other people, because why not. 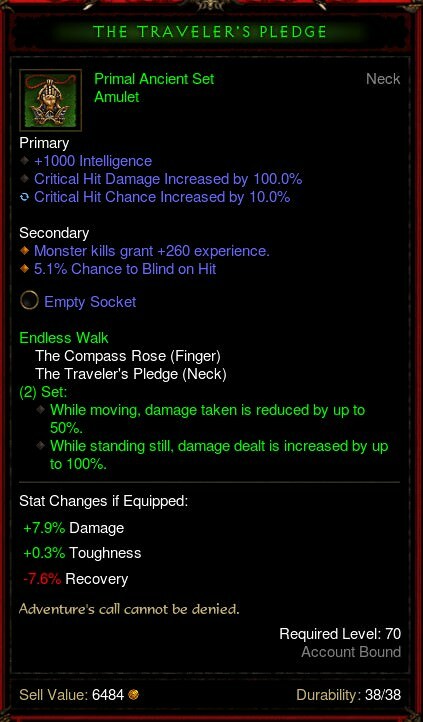 Btw, if you put the stats in D3Planner you'll figure out that due to the high CHC (compared to CHD) it's usually better to roll to elemental damage (of course depends on build and gear etc, but was the case for my WD a few seasons ago when I did the math).